This reissue marks the first time this landmark title has been released on LP in stereo! "I was so pleased with the job Analogue Productions did with their reissue of Out of the Cool, Evans's 1960 Impulse! 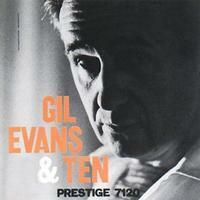 album, that I immediately ordered their vinyl edition of Gil Evans & Ten when it became available. This is the recording's first release on vinyl in stereo ... The new LP more sharply presents Steve Lacy's soprano sax in Cole Porter's "Just One of Those Things," and the instrument plays better against Evans's percussive piano lines. I could hear the band easing in behind Evans in the early moments of the track, and it sounded more dynamic as the arrangement built. Evans's high notes about two-thirds of the way through sound fuller, rounder toned, and more emphatic on the Analogue Productions LP. ... this new pressing reveals more depth and warmth in the sound, and lets me feel as if I'm closer to the band, and able to hear more of what's going on in the music." Musical Performance = 4 1/2 Stars; Sound Quality = 4 1/2 Stars; Overall Enjoyment = 4 1/2 Stars — Joseph Taylor, SoundStageUltra.com. Read the whole review here. In 1957, Miles Davis, high on the success of his recent collaborations with his old friend Gil Evans, persuaded Prestige Records to give Evans his own record date. Evans packed the resulting album with the brilliance that music insiders had recognized since his days as an arranger for Claude Thornhill in the 1940s and his work on Davis’ Birth of the Cool recordings. Writing for only 11 instruments, Evans used his wizardry with dynamics, motion and harmonic voicings to create orchestral effects suggesting a substantially larger orchestra. His settings stimulated his musicians to inspired improvisation. Among the soloists are trombonist Jimmy Cleveland, saxophonists Steve Lacy and Lee Konitz, and Evans himself, making his first recorded appearance as a pianist. Customer Reviews (4.00 Stars) 3 person(s) rated this product. F A N T A S T I C !!!!!!!!!!!!!! Buy it. Fantastic sound and performances. Dead quiet, excellent musicality. Another sonic spectacular by Analogue Productions. Crazy good music, sonics and pressing. Highly recommended.